Why Most Bloggers Never Make a Dime? I receive emails like this all the time. They don’t stick with a single strategy. Rather than focusing on one or two techniques to drive traffic and monetize their blogs, they keep jumping from one boat to another. If it works for you, keep doing it until it stops working for your blog. That’s all it takes to build a successful blog. Instead of trying everything at once to get more traffic to your blog, try just one thing like Facebook Ads or Blogger Outreach. Instead of trying to make money from your blog in a thousand different ways, try only one or two of the strategies laid out below. The more you complicate your process, the less success you will have. Keep things simple and you can have all the success you want. Blogging has helped thousands of people quit their jobs and travel the world. Not only that, it has helped some of them build multi-million dollar business empires. Although it is difficult like any other good thing in life, it is possible. According to a survey I did into MasterBlogging Facebook community, majority of bloggers struggle to make even $100 per year. But don’t get discouraged by those numbers. That is the amount of money the average blogger makes. The average blogger only works on their blog when they feel like it, which translates to roughly 2-4 hours a month. The amount of money you can make from your blog depends on how much time you invest in your blog. First 6 Months: This is where you lay out the foundation for your blogging career. Most bloggers don’t make any money in the first 6 months but if you work hard, you can start generating a passive income. 6-12 Months: You will start to see your work pay off. You will start receiving checks for the hard work and time you have put into your blog. Most bloggers start pulling in $500-1000 a month at this stage. You will also start receiving some free traffic from Google. 12-24 Months: At this stage, if you have put in enough work, you will start making more than a passive income from your blog. Most bloggers are able to make a full-time income at this stage. Although the above numbers sound great, it all depends on how much time and effort you put in. If you are only spending like an hour or two every month on your blog, don’t expect to see any quick results. Most people try to overcomplicate monetizing their blogs when they are just starting out. If you are just starting out, it’s not the time to test out a dozen monetization techniques to find the perfect one. It’s time to start building your audience. Once your blog starts receiving a good amount of readership, you will have all the time to perfect your monetization strategy. What is the best way to monetize my blog? It depends on how much traffic you get on your blog. Ads: This is the strategy I recommend most beginners to start out with. It is the easiest to set up and takes up next to no maintenance every month. It is perfect if you are looking for a set and forget option. Affiliate Marketing: You can start promoting affiliate products right from the start but I don’t recommend doing so. Most beginners who start with affiliate marketing soon get greedy and start publishing content that doesn’t add any value to the reader. That is the surefire way to making sure no one reads your blog. Selling Your Own Courses: Only start working on this when you have a big enough audience and you know what your audience really wants. You don’t need thousands of email subscribers or social media followers for this to work. But having a few hundred people on your email list who frequently visit your blog will make sure that your first course doesn’t fail. Although I recommend starting with advertising if you are a beginner, read this article through the end to build a vision in your mind of what you need to do on every stage of the journey. Time Investment: Next to nothing. The simplest and the easiest way to make money from a blog is to slap a few ads on it. Although it sounds simple and easy, most people don’t do it right and then they cry when they don’t make any money from it. The amount of money you can make from ads will vary depending on what industry you are in and what type of ads you put on your website. Sign up for Adsense or any other ad network. Place a few ads on your website. Publish interesting articles that will attract a lot of readers. You will not only make money for every click, but you will also get paid a few cents for every visitor who sees the ad on your website. The more clicks the ads receive, the more money you will make. They place ads in places where no one will see them. If you want to make money with ads, you need to get people to click them. And the only way people can click the ads is if they can see the ads. Most bloggers place ads below the article or in the footer. Most people will never reach the end of your article. If you want to make sure more and more people see your ads, you need to place them in places where people will actually see them. The ad is placed right at the top of the website. You need to place your ads above the fold if you want to increase the chances of people clicking them. Pro Tip: The area of page users can see without scrolling is called the above the fold area. The ad is placed in the sidebar of the blog. This is the second best area to place an ad on your blog. It will be visible as soon as the reader visits your blog. Because if someone has clicked the link to your blog post, then it means they want to read it. When you place an ad right at the beginning of the blog post, it becomes the first thing they will see. The header of your blog (if possible). The sidebar of your blog. The beginning of your article. Time Investment: 2-3 hours a week. It is my go-to strategy for making money from a blog. With affiliate marketing, all you have to do is promote other people’s products. When someone buys an affiliate product from your custom link, you receive a commission. Promote other people’s products = Make lots of money. When you promote other people’s products, you remove the need to provide support to your customers and dealing with any issues that might come up. Hell, you don’t even have to make the product. Find products in your niche that have an affiliate program. Sign up for the affiliate program for the product you wish to promote. Now, take the special link you received from the affiliate program dashboard and promote it on your blog. You make a commission on every sale you send to the product’s owner through your link. They promote the wrong affiliate product to the wrong audience. Finding an affiliate product to promote is easy. But promoting it is where most bloggers fail. If you want to sell a product, be it your own or someone else’s, you need to promote it to the right people. If I want to sell a sports car that’s worth $2 million dollars, I need to find the people who have the money to buy the car and actually want to buy it. As you can imagine, most people won’t have that kind of money. And that is why most people won’t be my customers. The right kind of people to promote that product to will be millionaires and billionaires. Similarly, if you are trying to promote a beginner’s video course on golf as an affiliate, you need to promote it to people who are just starting out with golf. Experienced golf players don’t need a course that is built for beginners. How do you promote an affiliate product to the right audience? Before you can promote an affiliate product, you need to attract an audience that will potentially want to buy your affiliate product. If you are promoting a product called “Beginner To Pro Golfer In 30 Days,” you need to write articles that will attract people who are beginners in golf. If you simply write articles about Golf, you will attract all types of audiences including Golf Enthusiasts, Beginner Golfers, and Advanced Golfers. But for our goal, we only want to attract the beginners who want to get better at Golf. Both of these articles will only attract people who are beginners. Likewise, if you are promoting a product that is for advanced Golfers, you will need to write articles that attract advanced Golfers. Once you start attracting readers to your site that are interested in the product you are promoting, you will need to actually promote the product. The best way to promote a product is to promote it without actually promoting it. 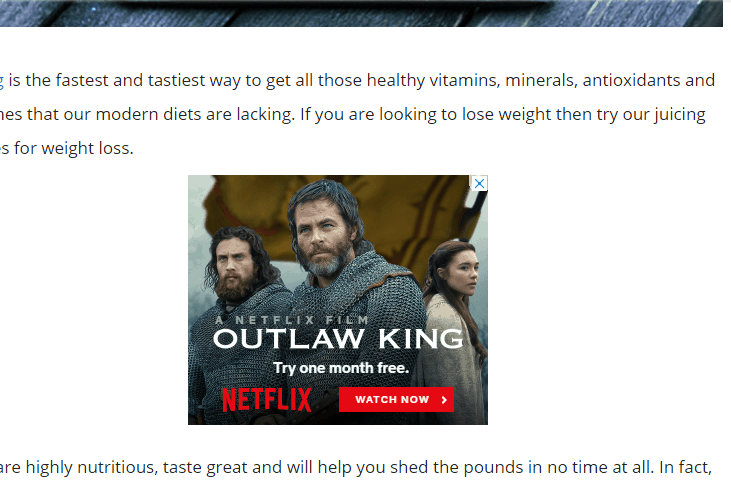 The screenshot above is from a blog post on Juicing Recipes for weight loss. The link you see in the above screenshot is an affiliate link that is promoting a Vegetable Juicer. The link in the above screenshot is a great example of promoting an affiliate product without making the whole article look like an advertisement. If you were promoting a product on Golf, you should link out to the product in a similar manner. Where To Find Affiliate Products To Promote? Sign up with an affiliate networks like ShareASale, CJ Affiliate, Avangate, Rakuten etc. Check what products blogs similar to you are promoting. Search Google for “Your Niche” + “Affiliate Program.” For example, “Personal Finance” + “Affiliate Program”. And follow these Affiliate Marketing tips to make most out of your blog traffic. Time Investment: At least 1 hour a day. Income Potential: 7-figures and more. Ramit Sethi, the guy I was talking about in the introduction of this article, made $5 million in only one week by selling an online course. Unlike affiliate marketing and putting ads on your site, selling courses online is a legitimate business. It can not only make you a full-time income but can turn your blog into a multi-million dollar business. Ramit Sethi started his personal finance blog from his college dorm room with no intention of ever working on it full time. But as his blog grew, he not only got interviewed on many different TV channels but also was able to turn his blog into a multi-million dollar business. He was able to do it with the help of online courses. If you spend any time on the internet, you have probably come across at least a hundred online courses. Everyone is selling an online course from Real Estate investors to Personal Finance Advisors. As you can see in the above infographic by I Will Teach You To Be Rich, Online Courses not only offer the highest profits but also require the least amount of investment in both time and money. You build an audience around your blog that likes your content. You ask them to sign up for your email list. Once your list has a few hundred people on it, you build a course and promote it to your email list. Most bloggers think they know what their audience wants. But the truth is you don’t know what your audience wants. You only think that you know what your audience actually wants to buy from you. The best way to build an online course is to first find out what your audience really wants and then build the course. If you want your first online course to be a success, you need to find out what your blog audience really wants. To find what your audience really wants, have a look at what type of articles in your industry get the most shares using BuzzSumo. Now, look for the keywords that tell you what your audience really wants. Once you know a little bit about what your audience really wants, search for eBooks on your topic on Amazon. Look for the common keywords that people use to describe what benefits they gained from the book and compile a list of all the benefits. These benefits will tell you what your audience really wants. When working on a product, keep these benefits in mind and make sure you make a product that includes these benefits. Whether you decide to monetize your blog with ads or affiliate marketing or by selling your own courses, don’t forget to produce quality content. Most bloggers start producing lower quality content once they start making some money from their blogs. If you want to keep making money from your blog remember to keep producing quality content. Start with ads and then promote Affiliate Products on your blog. And once you have a big enough audience on your blog, start selling your own courses. Now, making money with a blog can be hard and can take a lot of time. Most people lose motivation when they get stuck in the process and give up the whole blogging thing. Thanks for your tips Ankit – I may play around with a few of them and have a great day. These are some great way to make money online. I prefer Affiliate Marketing, Adsense and Product review. Really amazing tips you shared regarding monetization. even you mentioned all possible way to make money online. I’ll try one of them, and mentioned which work best for me. One more tips: Before monetization your blog checkout your traffic such as from where they come from. I enjoyed reading your post, the fact is that it is very very important to build an email list because that is the only way to help build your network and grow your business. Just like you said, if you have a huge number of email list companies would come knocking at your door step for sponsored post and reviews and you would end up making money..
You points are strong and challenging and I must confess, I have learnt something from it, Thanks for the share man !! The above are the best way to make money through blogging. You did a great job by adding this article as these methods are best. I personally like AdSense and affiliate marketing as it gives us more power to earn. I also interested in email marketing and found some better tips here. Thanks Ankit for such a informative article.. Indeed, this article is great because it covers everything and is very deep. Awesome! To build an email list, I also use ininbox as well. Although now I don’t quite understand how it works, but I’ll look at it later to better understand it. Hi Ankit, This post could help many bloggers and I would say this article was awesome till end of this I was so excited to read the full story. I always love to ” selling own products ” would be more productive income and it can show huge amount in hands. Hope you get a chance to visit my blog too. Ankit no doubt Google AdSense is a great way to earn money from blogs. But if anyone is not happy with the earnings that they are able to earn with AdSense, they can give try to other way outs. For tech blogs, buysellads could be a great way. And blogs which talks about blogging and seo related stuff, could earn decent money with affiliate products and selling their own services. Excellent Tips Ankit, Especially selling the banner ads does help in flat monthly income and If you have traffic you can certainly monetize using all these methods. I think Hosting Giveaways is also an option to monetize a blog, even though i haven’t tried it yet. Keep sharing the awesome content. you said, if you have a huge number of email list companies would come knocking at your door step for sponsored post and reviews and you would end up making money but how can i agree on that please explain. I never felt happy before with appearance of blog but after seeing your site , it was fantastic theme , keen layouts. Thanks for the tips. I enjoyed reading this article. This will be really useful for new bloggers. Most of the bloggers who just wants to make quick money from their blogs will definitely fail. I suggest bloggers go slowly and try to think logical. I do adsense, affiliate marketing, product reviews. Do you think email listing still works? I heard that it was outdated. As usual, Good stuff on BTT. I was asked to put two method at the top of list than i will put Affiliate followed by email list. Actually email marketing will also benefit affiliate. I am not doing any one of these as of today morning ( LOL). I think i have got enough motivation now to align my efforts and move on. My belief in principal – One should put efforts behind activities that can give consistent income. Yesterday my wife bought a Mobile from flipkart after reading a review on an a blog and that was a affiliate link. BTW Good post. I couldn’t ever understand that how to earn money through blog but your post seems very inspirational. I am newbie in digital marketing and one of my friend is helping me so I am working on it regularly. I found this post on Google and it contains very useful content. Thanks for sharing such an awesome post here. I have one method I used that got me instant $250. I’ll be sharing it on my blog and hope it will help readers. These are really great tips for all, i am helped. Your feedback is appreciated, Tusshar. Hi Ankit, truly speaking there are lots of ways to monetize a blog as long as you have good number of visitors. Visitors are the backbone of blogging earnings. The methods you have mentioned are quite popular. But there is a method that most bloggers don’t try and it works even on small blogs. Even if you run a small blog, there must be some articles that rank well on Google search. And if it does, you can really earn some extra money from these articles only. Dig into your Google webmaster account and find out some articles that rank on first page. Now list the keywords the articles are ranking for. Search them in Google and see if you find any advertisements or not. You will surely find some Adwords ads. Please understand these advertisers are paying Google to rank for the keywords your articles are already ranking for. They will pay you if you promote your articles to them. Just reach and let them know you have some of your blog articles ranked for the keywords they are targeting for their ads. If they want, they can get an ad-space inside those articles. If not all, many advertisers will be interested to work with you. I have personally used this method on my blog and it worked like a charm. I’ve already been paid several times. I am finally getting good traffic numbers, and I want to start monetizing my blog. Adsense has not been working well, so i am definitely looking at other ways to monetize. Thanks for all these great ideas here. Can’t wait to get started! You should try selling your own products/services. It will help you a lot. Good luck! All the above methods of blog monetization are really effective if used properly. However, the ones I’ll go for and also recommend to people is blog services, creating and selling your own product and affiliate marketing. Those are really the most profitable ways of monetizing a blog and which ever one you chose, make sure you’re building an email list. I’m creating my product, at this time. What amazing post Ankit! thank you so much for these valuable informations about monetizing blogs. im personaly using Google adsense and infolinks also i put referrals link for others networks and companies to maximize my earnings. i am ankit..i m a student and have interest in blogging…i want to know that …How much Money i need to spend on a blog to earn !!! Really informative article, with shareable content! It is true that most of new bloggers create their blogs with the mind of making money with it one day. As older bloggers say” Don’t think of money”. Most new bloggers including me blog with the mind of money. It is very disappointing when you don’t make even a singles cents for about 6 months. It is painful when others tell you that they are earning but patience is the key. Ankit , this article is very useful. To you blogger, never give up, keep on doing it and follow what others tells you. It will pay off even if it may take time. I started monetize my blog using adsense. But i was not positive with the income and then i moved to affiliate marketing. But though some profit, i was not actually getting enough money from it. So i decided to provide services such as logo design, wordpress theme development, website development. Now I’m happy with the income. I’m earning around $1200 consistently from my blog. Though i have invest more time on working for the project. But with less amount of traffic, I’m satisfied with the income. I have read the most of your articles. I am a new blogger and don’t know about blogging. I want to make my blog reach to more people so please guide me. I am not too greedy to just make money online but want to make information to me reach to more people. Sorry for language. Thanks for the wonderful post Ankit. I have been blogging for past 3 years and mostly earning using Adsense. Now, I have also started affiliate campaigns on my latest website. Hope it goes well. Working to build a great email list now. Thanks again! Hi Ankit, your list of monetization options for bloggers are very enlightening. When I started blogging in 2009, Adsense was the only way but slowly bloggers started exploring other avenues for making money from their blogs, the good thing is now there are many fall back options to survive in case one revenue stream is dead. I liked your post so much that I linked to this post from one of my blog posts. Wow, These tips are very important for all the website owners who wish to monetize their sites in an effective way. It”ll be amazing to work firstly with premium monetizing service providers like AdSense if not possible then we may go for other choices around. This is is a great blog post gave me so many avenues that I would not even think about. I really do appreciate it. Loved the way you have expressed you thoughts and ways to make money via blog. After reading I have shared this article with my audience to get benefitted. I come to know about blogging from my engineering. but I didn’t follow the industry experts like you and also as you said not stuck to one blog and also one monetization strategy. now, I started the blog with my name and sharing blogging related information. still, I confused to monetize my blog. as you said, start with the ads and affiliate marketing. then move to own courses and products. this is a very helpful thing. really you are doing an awesome job. Thanks for the guide Ankit, could you please tell me you mentioned some affiliated program, are these OK for India. Super tips Ankit! Gotta stick to 1 strategy for a bit to see appreciable results. Generosity, patience and persistence wins.